It is brussels sprouts week at Food Network. Brussels Sprouts are one of those vegetables that people either love or hate. (I fall in the love category) Years ago I was hosting one of those "everyone without family nearby come for dinner" Thanksgivings. I planned my traditional menu but friends kept asking for their family favorites to be added. Creamed onions? Pecan pie? and brussels sprouts...steamed brussels sprouts. You may have noticed this particular group did not offer to bring these dishes...I was asked to make them! :) I love cooking and I love Thanksgiving so this was a labor of love. I decided creamed onions did not need to be made every year...and I am just OK with pecan pie...but the brussels sprouts? Delicious... I really enjoyed this dish. I started experimenting with different ways to prepare this brassica...part of the cabbage family. Hands down, my favorite technique is roasting which brings out the natural sweetness and tones down the bitterness some people experience. 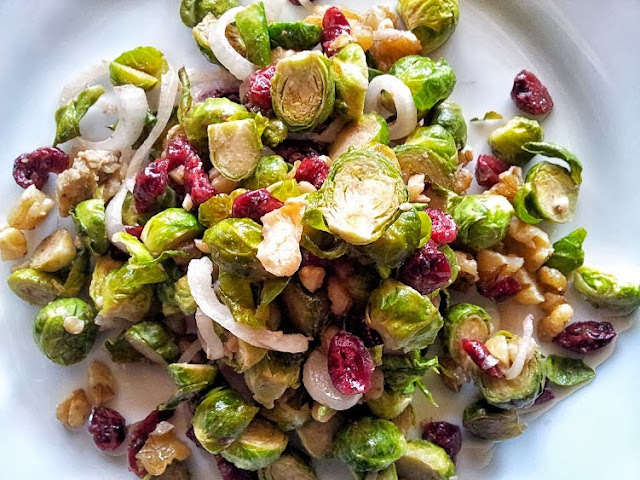 I decided to make a salad of the roasted sprouts and added onions, dried cranberries and toasted walnuts. Tossed with an Asian Tahini Vinaigrette, this is a perfect fall or winter salad. Might just be added to the Thanksgiving day menu. Thoughts? Preheat oven to 400 degrees. Line a rimmed baking sheet with parchment paper. Add brussels sprouts. 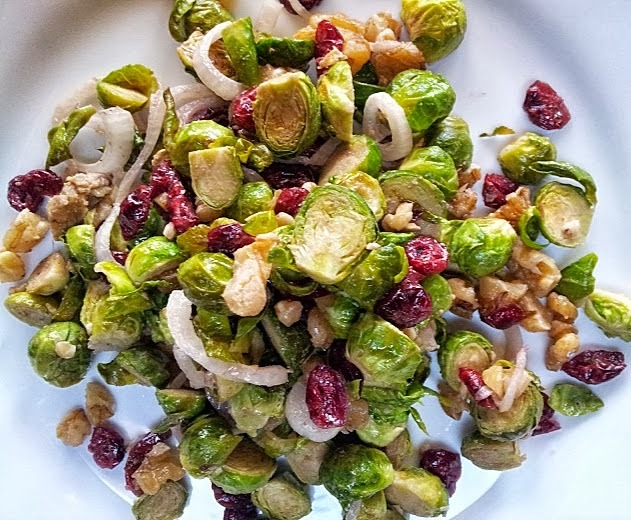 Drizzle 2 tbsp olive oil over sprouts and sprinkle with a large pinch each salt and pepper. Roast in oven for 15-20 minutes or until they are fork tender and caramelized. Remove from oven and set aside allowing to cool to room temperature. While sprouts are roasting, add walnuts to small dry skillet. Toast over medium heat until just beginning to brown, stirring frequently. Do not allow to burn. Set aside. Add sliced onions to small bowl. Cover with cold water and allow to soak to 15 minutes. Drain and set aside. Add 1/4 cup olive oil, tahini, sesame oil, water, soy sauce, vinegar ginger and dried red pepper flakes to small bowl. Whisk until well mixed. Add brussels sprouts to medium bowl. Add onions,cranberries and parsley. Stir to combine. Drizzle 3 tbsp tahini vinaigrette over salad and toss. Add walnuts and toss again. Taste and add additional vinaigrette if salad is too dry. Serve passing additional vinaigrette at the table. It is "brussels sprouts" week at Food Network's Fall fest. Check out the other delicious sounding recipes from my blogger friends. 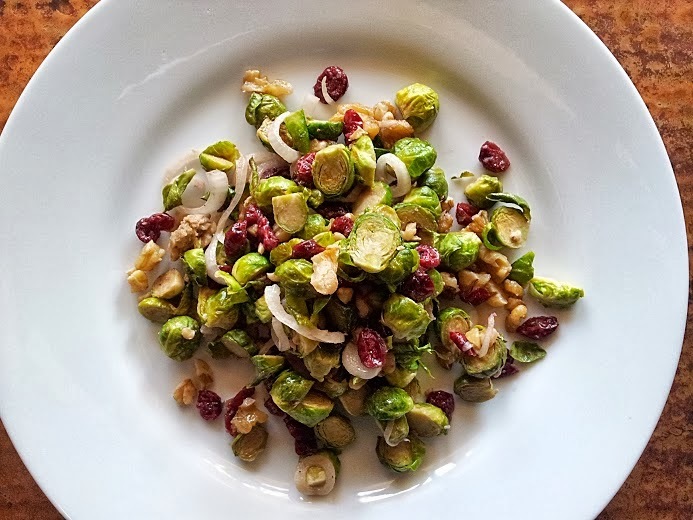 Have a favorite brussels sprouts recipe of your own? Please share in the comments section of this post.